This article is based on 1.6 code. In 1.7 ver#, ‘Unsafe’ class is used to directly write to memory location. ConcurrentHashMap main motive is to allow concurrent access to the map. HashTable offers synchronized access to the map but the entire map is locked to perform any sort of operation. 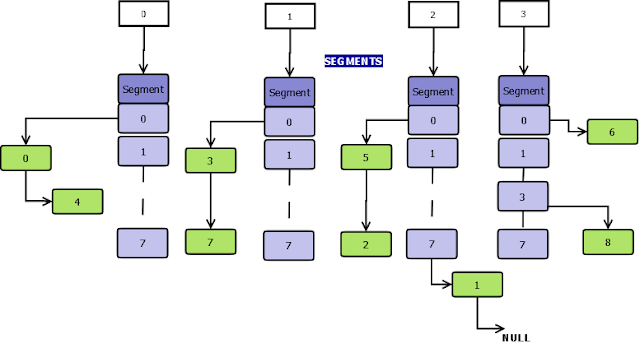 In ConcurrentHashMap, the basic strategy is to subdivide the table among segments so that the lock is applied only on a segment rather than the entire table. Each segment manages its own internal hash table in size 2x >=(capacity/no. of segments). Locking is applied only for updates. In case of of retrievals, it allows full concurrency, retrievals reflect the results of the most recently completed update operations. If we assume four threads are going to concurrently work on a map of initial capacity 32, we would want the table to be partitioned into four segments, each managing a hash table of capacity 8. 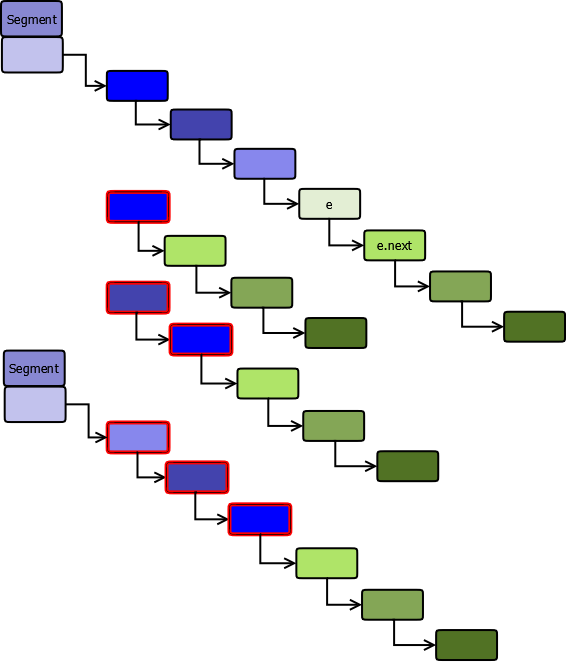 For comparison sake, below figure shows the data structure of a HashMap. The collection maintains a list of 16 segments by default, each of which is used to guard (or lock on) a single bucket of the map. This effectively means that 16 threads can modify the collection at a single time (as long as they’re all working on different buckets). This level of concurrency can be increased using the optional concurrencyLevel constructor argument. The maximum size it can go up to is 216. Greater the concurrency level, greater would be the no. of segments and lesser the size of hash table that the segment manages. Using a significantly higher value than you need can waste space and time, and a significantly lower value can lead to thread contention. ConcurrentHashMap doesn’t allow NULL values. The key cannot be NULL, it is used to locate the segment index and then the actual bucket within the segment. The key’s hash is re-hashed to strengthen the hash value to defend against poor quality hash functions. This is important as the hash will be used to locate both segment and hash table index. The upper bits will be used to locate the segment index and the lower bits to locate the table index within the segment. 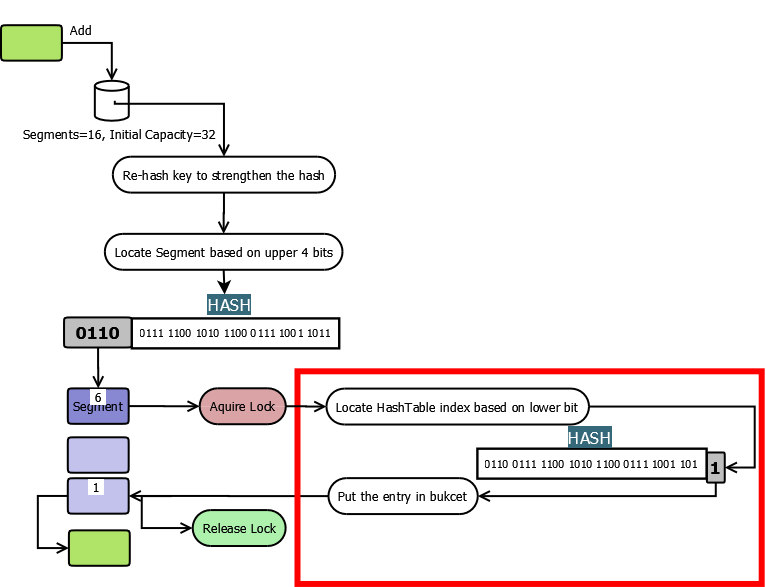 This is why re-hashing function is different from that of HashMap as the hash bits need to be spread better to regularize both segment and index locations. Thread A is trying to remove a key, calls remove(key), acquires lock. Thread B tries to execute above code, calls containsKey(key). The key exists as Thread A has not yet released the lock so the old value is returned. Thread A removes the key and releases the lock. The above scenario proves that the code is not atomic as it returned a key which it thinks exists but actually doesn’t. Also, performance wise it is slow, containsKey has to locate the segment and traverse through the table to find the key. Method put needs to do the same traversing to locate the bucket and put the value. The new method putIfAbsent is a bit faster as it avoids double traversing. It goes through the same internal flow as put, avoids overriding the old value if key already exists and simply returns the old value. Below class diagram shows that ConurrentHashMap is made up of Segments which in turn is made up of HashEntries. HashEntry is an immutable class so the next link can’t be adjusted. All entries following removed node stays in the list, but all preceding ones need to be cloned. Since power-of-two expansion is used, the elements from each bin must either stay at same index, or move with a power of two offset. For a capacity of 16 elements, sizeMask would be 1111 so the lower 4 bits of hash will form the index. When the capacity is doubled, sizeMask would be 11111 and now the lower 5 bits of hash will form the index. So the index would be same if the 5th is 0 else the index would be incremented by 24. 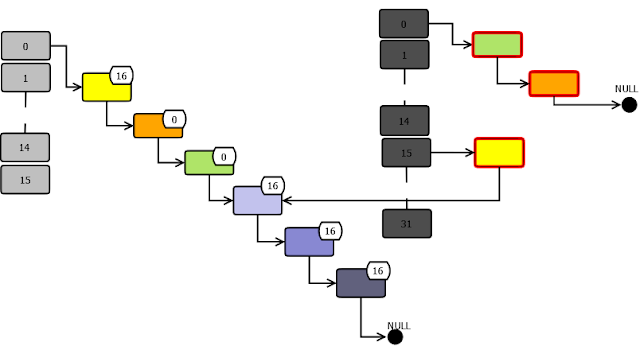 The trailing consecutive sequence nodes can be re-used instead of unnecessary node creation if they they point to the same slot after the re-hashing. Here in the below example the trailing nodes in blue hues will all end up in the same index.